Home Ancient History Ancient Egypt What food and drink were Ancient Egyptians consumed? What food and drink were Ancient Egyptians consumed? About 450 B.C., the Greek historian Herodotus wrote that Egypt was a gift of the Nile. Indeed, for the Ancient Egyptians the river was a gift of the gods, and one of the more important tasks of Egyptian kings was to speak respectfully to the Nile gods, who gave or took away the water. During the annual flood season, between June and September, the Nile would burst its banks and cover the adjacent flood plain. When the waters receded and went back to their normal levels, they left behind fertile black mud, which the Egyptians called Kemet (black land). The black earth, rich in minerals, was the basis of this civilization, surrounded by the hostile desert terrain. After the floods, in October and November, ploughing and sowing took place; from January to March or April the cereals and fruits ripened and were then harvested. By looking at the wall-pictures, hieroglyphs, and models discovered in the tombs, we can see that they have left behind a record of what they ate and drank. Bread was the principal food in the ancient Egyptian diet, and also the currency in which pharaohs paid their workers, since money as such did not exist at the time. Often, it was round in form, sometimes with a hole in the center that was usually filled with vegetables. It was predominantly made from emmer wheat, which was extensively cultivated in the ancient civilizations, and barley. Grinding the grain into flour was done by hand, and this was mainly the task of the women. The Nile river was an excellent source of many types of fish such as eel, carp, catfish, and mullet. Along the river, there were restrictions on the types of fish that could be eaten because of their connections with the gods. Fish was popular with the lower classes, while the upper classes considered it unclean and associated its strong smell with sin and impurities. Temple priests avoiding ate fish and they also avoiding it as an offering to the gods. Because of the hot climate, fish had to be preserved by salting and brining, drying, or smoking if not eaten immediately. For the Ancient Egyptians, having domesticated animals for the sole purpose of meat consumption was expensive. Most of the fertile land was used for growing crops rather than providing grazing land for animals. The temples and wealthiest classes owned enough land or had enough resources to raise and eat these animals, but the poorest class regarded the meat of domesticated animals a luxury food and ate it mostly on special occasions such as festive celebrations. 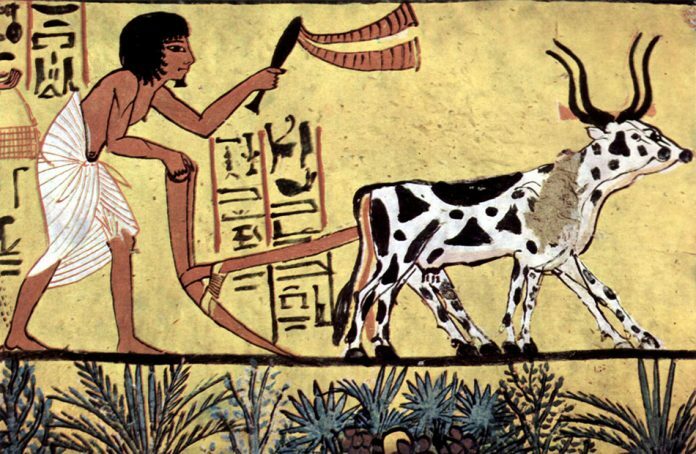 In addition to cattle, the Egyptians kept sheep, goats, and pigs. Wild game was hunted in the Delta of the Nile, and poultry such as ducks, pigeons and geese were captured into nets in the swamps and kept on farms for food. From the desert came antelope and gazelle, which were enjoyed at special occasions. Pork was consumed mostly by the lower classes, while the upper classes and priesthood considered it unclean and also avoided it due to its association with Seth, the god of chaos. Vegetables and fruits were plentiful in ancient Egypt and usually eaten as a complement to bread and meat. Egyptians grew grapes, figs, dates, pomegranates, onion, garlic, watermelons, lettuce, cucumbers, carrots, celery, peas, beans, lentils, and chickpeas; also was there no lack of tropical fruits like mango and avocado. Garlic was popular, because Egyptians know that garlic contain disease-fighting properties. Beekeeping began in Egypt around 2400 B.C.. Egyptians loved honey and considered it sacred—honey represented the tears shed by the god Ra, from whom man was born. They not only kept domesticated bees, but also actively searched for the honey of wild bees. This rare delicacy was used to sweeten food, drinks and dessert; it was highly valued because sugar was unknown at the time. 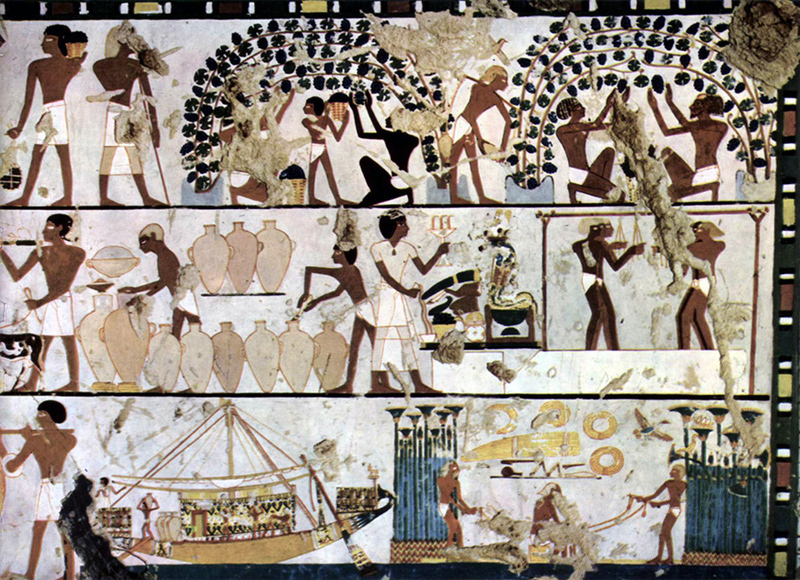 The main centre of beekeeping was Lower Egypt with its extensive irrigated lands, where flowering plants bloomed. Dates and fruit juice were the sweeteners used by the poorer classes. The main herbs and spices used to flavour ancient Egyptian food were coriander, salt, cumin, marjoram, thyme, and cinnamon. Beer was the national drink of ancient Egypt. Beer was known as heqet, tenemu or kha-ahmet. 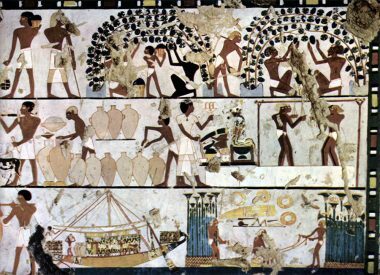 Beer was consumed daily­ by Ancient Egyptians, and on an especially wide scale by the lower classes. The old Egyptian hieroglyph for meal was a compound of the hieroglyphs used for bread and beer. Therefore, the typical Egyptian everyday meal consisted of bread, beer, onions and some fish. Beer was far more popular than water and drunk by adults and children alike. Ancient Egyptians knew many types of beer; most were made from barley, some from emmer wheat, and many were flavoured with honey or ginger. Wine was another drink the Ancient Egyptians held in high esteem. Having first come into use in the Old Kingdom by the wealthy, it later became a drink common to the entire population. Numerous varieties of grapes were cultivated: the largest production centres were near Alexandria and in the oases of Dakhla and Kharga, at the Libyan border. It was also imported from Syria. The wines were generally red, often sweetened with honey or perfumed with spices. The production of wine was time-consuming and costly; therefore, it was mostly accessible to the wealthy, who drank it at lavish banquets or used it in religious ceremonies. The meals of the lowest classes were generally accompanied—besides water and beer—by more common drinks such as goat’s, cow’s, or sheep’s milk.